Bengal florican has two distinct populations, one in Indian sub-continent and the other in Southeast Asia. The subspecies Houbaropsis bengalensis bengalensis occurs in Indian sub-continent from Uttar Pradesh through the Terai of Nepal and Assam and Arunachal Pradesh in India to Bangladesh. However, they are now extinct in Bangladesh. The Southeast Asian population represented by Houbaropsis bengalensis blandini occurs in Cambodia and Southern Vietnam. Due to very small declining population, the Bengal florican is listed as ‘Critically Endangered’ in the Red List of Threatened Species by International Union for Conservation of Nature and Natural Resources (IUCN) since 2008. The decline of the species has accelerated dramatically between 2000 and 2010. Conservationists anticipate total extinction of this bird species within one to two decades unless drastic measures are taken to protect its habitat. The global population of Bengal florican is not more than around 1,300 individuals. In Indian sub-continent its population is near about 400 individuals. 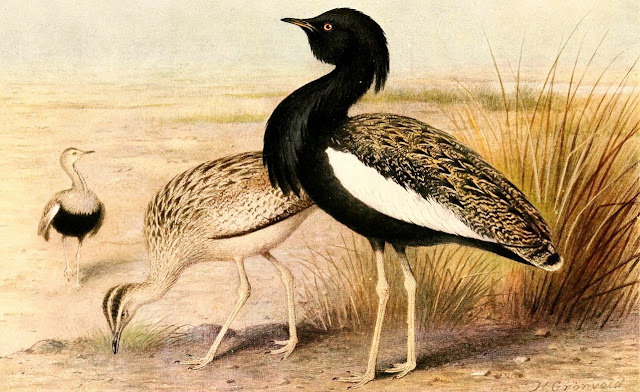 The population of Bengal florican in Nepal is about 40 individuals whereas its population in India is estimated to be less than 350 individuals. State wise the current populations of Bengal florican are 70-80 individuals in Uttar Pradesh, 180-220 individuals in Assam and 40-50 individuals in Arunachal Pradesh. Bengal florican is a medium sized ground bird ranging from 66-68 cm in length and stands around 60 cm tall. It has mostly black plumage. Bengal florican shows distinct sexual dimorphism. The adult males have black head, neck and body with white wings which is distinctly visible while flying. However, when standing the white wings are seen as a thin patch on either side of the body. The back is mottled with buff-brown. However, during the breeding season males have a thick bunch of feathers hanging under the breast. On the other hand, the female and immature male is dull brown and molted on the back. The females are slightly larger in size than males. Adult females weigh around 1.7-1.9 kg while the adult males weigh between 1.2-1.5 kg. Female Bengal floricans have been found to be elusive and cryptically coloured consequently; females are less frequently seen than the conspicuous territorial males. Bengal floricans are extremely habitat specialized birds and are restricted to alluvial grasslands. They inhabit lowland dry or seasonally inundated natural or semi-natural grasslands. The important grass species of these grasslands include Imperata cylindrica, Saccharum munja, Saccharum narenga, Saccharum spontaneum, Themeda arundinaceum and Desmostachya bipinnata. These grasslands are characterized by a high diversity of grasses, sedges and shrubs and are sparsely scattered with trees such as Acacia catechu, Phyllanthus emblica, Bombax ceiba etc. The Bengal florican, although a capable flier, is most often seen walking or running along the ground. They walk slowly while foraging or moving from one site to another. Male floricans fly a lot during the breeding season mostly to chase away an intruding male. Among all Bustard species the Bengal florican has one of the most spectacular and breathtaking flight displays. They are omnivorous and known to feed on various seeds, grain, tender shoots of grasses and insects like grasshoppers, ants, beetles and even small snakes and frogs. The proportion of these various food items varies depending on their availability, so that plant matter dominates in winter and spring, while invertebrate prey becomes more important in summer. Sugarcane is a primary source of nutrition for the Bengal florican. Wild growing and cultivated sugarcanes help to give the bird energy and long-term nourishment. The breeding season of Bengal florican starts from February and lasts till early July. During the breeding season the male Bengal florican establish individual territories in open areas in short grasslands. The adult males show a characteristic flight display within the territory to attract female floricans for mating. Contrary to the exhibitionist behaviour of the males, females are far more secretive, visiting a male territory only briefly to breed and forage. They do not prepare a proper nest. They just lay eggs after scratching bare ground. The clutch size is 2-3 eggs. The eggs are glossy and olive-green in colour with several tiny purple-brown freckles and blotches. The eggs are incubated for 25-28 days by the female. The female raises the young without any help from the male. Habitat loss is the main threat to the survival of Bengal floricans in their range. Grasslands throughout their range are threatened by drainage, conversion to agriculture, over-grazing, invasion by exotic flora, flooding, development of irrigation schemes and inappropriate cutting and burning regimes. In Cambodia the Tonle Sap grasslands is an extremely important area for breeding of Bengal floricans have declined by 60 % since the late 1990s. The intensification of paddy cultivation is playing a significant role in this loss in recent years. Hunting for sport and food has also been a threat to this bird species in Cambodia. Collection of eggs by local people for consumption and trampling of eggs by the grazing livestock are the other threats to the Bengal florican. Bengal florican is listed on Appendix I and II of the Convention on International Trade in Endangered Species (CITES) and in Schedule I of the Indian Wildlife Protection Act, 1972. The Bengal florican is listed in the National Wildlife Action Plan 2002-2016. It is also listed under the CMS Convention. It has also been identified as one of the species for recovery programme under Centrally Sponsored Scheme of Wildlife Habitats of the Ministry of Environment and Forests, Government of India. Several populations of Bengal florican occur within protected areas. The most important being the Bengal florican Conservation Area (BFCA) network in Cambodia, Royal Chitwan National Park, and Royal Bardia National Park and Sukla Phanta Wildlife Reserve in Nepal, Kaziranga National Park, Dibru-Saikhowa National Park and Dudwa National Park in India and possibly in Tram Chim National Park in Vietnam. In some of these protected areas, efforts are underway to maintain valuable grasslands by uprooting woody vegetation, and a schedule of controlled fires and collection of cut grass by locals for thatch. This will help in creation of more suitable habitats for the Bengal florican. 1. To regularly monitor the population of Bengal floricans in their natural habitats and protected areas. 2. To protect breeding areas from all kind of human disturbances by restricting development and land use diversion. 3. To check grazing in the habitats of Bengal floricans as their eggs are often trampled by the livestock. 4. To check the repeated burning of grasses. 5. To strictly enforce the Wildlife Protection Act and CITES. 6. To focus Bengal florican as one of the attractions and encourage eco-tourism as source of livelihood for local unemployed youth in nearby areas inhabited by the bird. Conclusively it can be said that Bengal florican is a highly threatened species of bird standing on verge of extinction mainly due to habitat loss. Therefore, it is the need of the hour to check the habitat loss of this bird species for its recovery from the state of near extinction.